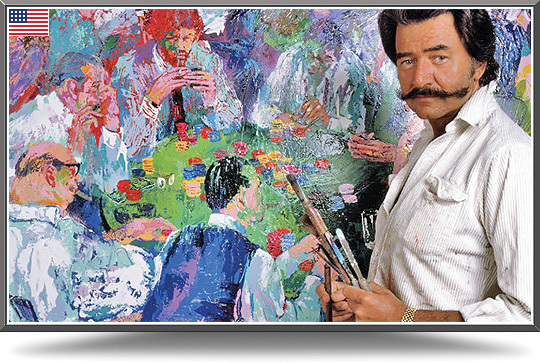 LeRoy Neiman (1921-2012) was born in Saint Paul, Minnesota, of Swedish descent. He became one of the most popular artists in the world. His bold, bright colors and graceful compositions combine elements of Abstract Expressionism, Fauvism, and Social Realism. Like a journalist reporting on people and society at work and play, he portrayed the stars of sports and entertainment, cafe society, casinos, stock markets, beaches, sail boats, golf courses ...and racing cars. Beginning in 1960, he traveled the world observing and painting leisure life, social activities and athletic competitions including the Olympics, the Super Bowl, the World Series, theKentucky Derby, championship boxing, PGA and The Masters golf tournament, The Ryder Cup, the World Equestrian Games, Wimbledon and other Grand Slam competitions, as well as night life, entertainment, jazz and the world of casino gambling. Neiman worked in oil, enamel, watercolor, pencil drawings, pastels, serigraphy and some lithographs and etching. Neiman is listed in Art Collector's Almanac, Who's Who in the East, Who's Who in American Art, Who's Who in America, Who's Who in the World. His works have been displayed in museums, sold at auctions, and displayed in galleries and online distributors. He received five honorary doctorates and numerous awards, a recent Lifetime achievement award from the University of Southern California, an induction into the International Boxing Hall of Fame and proclamations and citations. Most recently he received The Order of Lincoln on the 200th birthday celebration of Abraham Lincoln given by The Lincoln Academy of Illinois. He authored twelve books of his art. His work is in the permanent collection of the Smithsonian, the Whitney Museum, the Brooklyn Museum, the Museum of Fine Arts in Boston, the State Hermitage Museum in Russia,Wadham College at Oxford and in museums and art galleries the world over, as well as in private and corporate collections. LeRoy passed away on June 20th, 2012.